and I put it on the wall. and I had to have them all. Let it take you where it may. and then sometimes it's best to walk away. Just to throw them all away. How can you compete against Appetite for Destruction? After all, Appetite was certified diamond 18 times over in the US and sold over 28 million albums worldwide. They might as well have named it Meal Ticket. Any follow-up effort would most likely be a step back for the band. Ultimately, they couldn't have recorded a follow-up album to Appetite at all; the second album would have to show greater depth, greater variety, and even better songwriting skills. Recording a follow-up to Appetite presented its own risks to the credibility of the band: sounding too much like Appetite would imply Guns was a one-trick metal pony; on the other hand, delving too deep into other genres and musical influences could dilute the long-term reputation of the band. Yet another pressure was speed to market. Just as The Stone Roses battled growing expectations over time, so too would Guns 'N Roses. Guns would have to prove that their second album was worth the wait. We all know how this story ends: the infamous double-release of Use Your Illusion I & II. The only silver lining in this grandiose double-disc effort was Slash realizing that they weren't Led Zeppelin, nor was Use Your Illusion a Houses of the Holy. It was the epitome of its era, why one when you can have two? (See also: Lyle Alzado). The era of bigger is better finally reached a pinnacle by the 1992 MTV VMAs - closing act and "Michael Jackson Video Vanguard Award" winning Guns 'n Roses (with special guest - Elton John!) were upstaged by both Pearl Jam ("Jeremy") and Nirvana ("Lithium"). Over the next 16 years, as grunge (and later, industrial) came and went, a paradigm shift occurred in the music world from mega speakers to earbuds. Indie became the new alternative, which was the new punk, which was the new hard rock. Gradually Guns became less relevant; its sophomore effort (and unfinished Chinese Democracy) models of what not to do. Axl would perform his best Syd Barrett impersonation, substituting shaven eyebrows for inexplicably terrible hair plug braids. Producing a single-album release would have had its complications. To begin, the compact discs can only store up to 80 minutes of music. Simply put, some songs which appeared on the albums would have been pushed to B-sides. Other songs would simply need to be cut (i.e., "My World"). Another issue with the single album approach is that compact discs had not yet surpassed cassette tapes in sales by 1991, creating another issue: balancing the two sides of tape to minimize dead air. These logistical constraints would have paled in comparison to the largest hurdle. Of course, the biggest complication of all would be Axl's grandiose pursuits. But if anyone could have managed to reign in Axl, it would have been Mike Clink. It was Clink who, while producing Appetite, convinced Axl to keep "November Rain" for the second album. Having helped them cultivate one of the twenty most successful albums ever made, Clink was probably the only person on Earth who could've convinced Axl that less could be more. Had he pressed for a single album, it would surely have been easier for Axl to drop his experimental tracks. Case in point: "My World" - when is the last time you've thought to yourself, "Axl could've totally started the Nu-Metal/Rawk genre with this song"? Or the last time you thought, "I love how Axl gets the last word in with Bob Guccione, Jr. on 'Get in the Ring'"? Never! The song was reportedly a surprise to everyone in the band except Rose. Do you think this would have been an issue if Use Your Illusion was capped at a single disc? Of course not. 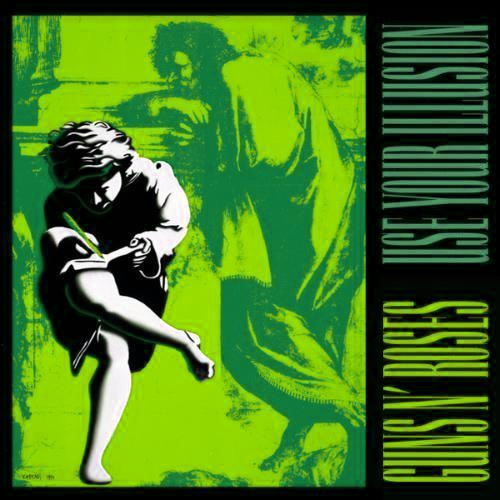 A single-album Use Your Illusion album was released in 1998 by Geffen, but is nothing more than a singles compilation and doesn't do justice for the albums' collective works. Consider the following: "Don't Cry" Original and Alternate lyrics on separate albums? Fine. On a single album? No way. In addition, the Geffen gave in to mass merchandisers like Wal-Mart by removing explicit lyrics. The good news is that got rid of songs like "My World" and "Get in the Ring", but that also disqualified songs which deserve to remain on the album. More importantly, Izzy Stradlin receives far fewer writing credits on the single-album issue - not the kind of incentive you want to give to the strongest contributor to UYI-era material. The deal-breaker to Geffen’s 1998 attempt was excluding Locomotive, the source of the album’s title. In order for a single-album Use Your Illusion to have been successful, it would have had to follow some general principles. First, the album should kick off with clear connections to Appetite-era Guns 'N Roses. In my opinion, there would be no better way to start that off than with two songs recorded in the Appetite sessions and tucked away for later. At the same time, the album would need to show growth and development from the songwriting on Appetite. This requires going beyond the "trilogy" (i.e., "Don't Cry", "November Rain", and "Estranged") to incorporate songs which reach across genres and influences. In turn, this would incorporate more songs penned by Stradlin. Finally, the first and second halves of the album would need to be complementary. Failure to place songs in the proper order would leave the album front-loaded or back-weighted; worse yet would be an uptempo first side and a ballad-heavy second side. For those of you keeping track at home, “Locomotive” is actually 8:42 long. However, nearly two and a half minutes of vamp fading out really makes this song lose its luster. At 6:28 long, this song would be one of the most powerful songs on the album. And, lest we forget, an absolute must simply based on the sole Use Your Illusion lyric reference on the entire album. What would have become of the album and the band, had it shown restraint and produced a single disc album? Arguably, this album could have outsold Appetite, challenged Back in Black for most popular hard rock album ever, and single-handedly supported the U.S. economy, lifting it from recession. More likely would be its ability to keep the band together. Seeing the success, Axl might have been more inclined to allow the band to share songwriting duties. Also more likely would be Chinese Democracy actually being released in the intended era (circa 1999 or 2000). In the end though, it was already probably too late for the whole of Guns ‘N Roses to remain greater than the sum of its parts. As a general rule of thumb, when the lead singer of the band rents a tanker for a video, you’ve probably peaked. Where else can you go but to become fixated on Charlie Manson and lament over Stephanie Seymour? The past couldn’t have been changed without Axl’s partner-in-crime. Would the Rolling Stones have been the Stones today if Keith and Mick didn’t bury the hatchet in the eighties? Of course not – and similarly, Guns ‘N Roses would never be anything more than an Axl Rose and Friends circus once Stradlin left.